Attention all foodies looking for a cooking show a bit more queer than Hell’s Kitchen and Barefoot Contessa: Married and Hungry returns for Season 2. 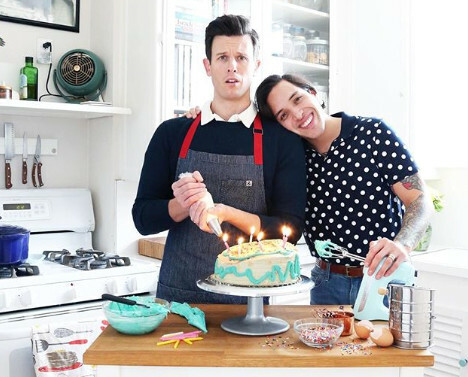 The hilarious cooking show, which streams on IGTV, features married pair Jonathan Melendez & Julian Clark having kitchen adventures, good bad and ugly, bringing out the joy in their relationship while also putting it to the test. Season 1 of the show enjoyed a following for its mix of humor and culinary follies, as author Melendez educates his actor husband on the art of kitchen experimentation. On occasion, their terrier Charlemagne makes a cameo. Related: Cooking With Bears Is Fun! Melendez also runs his own blog, The Candid Appetite, where he features the recipes he and Julian use on the show. The new season launches on Wednesday, March 6. Have a look at the Season 2 trailer, and check out a few Instagrams of the inaugural season too. Just add “Cat Rescuer” to my resume! — Season 2 coming soon! In the meantime, catch up on/rewatch the first season over on my IGTV channel! @thejulianclark had one job and one job only! ???? ?— Season 2 coming soon! In the meantime, catch up on/rewatch the first season in my IGTV channel! Happy Thanksgiving, friends. May you have a great day filled with amazing food and may you be blessed with a visit from Turkey Claus himself. ?? ?